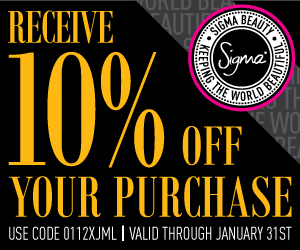 Sigma Beauty Affiliate Program: Sigma Affiliate 10% Discount Code! We have created a special 10% off code for you to share with your followers! 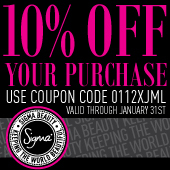 The code 0112XJML will be valid from January 1 to January 31 for 10% off your entire purchase! We have also designed new affiliate banners that display the code. To use one of the banners, save the image to your computer, upload it to your blog as a picture and insert your affiliate link as the URL. 1) Update your blog with one of the 10% off banners. Make sure you insert your affiliate link as the banner URL. 2) Place your affiliate link in the first line of your YouTube video info box and include the 10% off code 0112XJML. 3) Share the discount code and your affiliate link in any blog posts related to Sigma Beauty. We hope you take advantage of this great money-making opportunity! Remember, the key to this strategy is always sharing the discount code and your affiliate link together. Feliz 2012 para todos da Sigma!! Thank you!!! already shared it on my blog! I've shared a banner on my blog! Olá Sigma... compartilhei no meu blog, vou compartilhar no facebook e no meu canal. Muito legal vocês criarem isso amei! Eu adorei a idéia e já atualizei o meu blog! how do we get the banner? @Rachel To use one of the banners, right click on the banner and save it to your computer. Then, upload it as a picture to your blog, and add your affiliate link as the URL! How do we get the Banner? i love sigma beauty. @Anonymous To use one of the banners, right click on the banner and save it to your computer. Then, upload it as a picture to your blog, and add your affiliate link as the URL! No habia visto esto en mi mail!!! I've shared the news to my readers. But I was wondering. Can we (affiliates) use de discount code ourselfs? @Germa Yes, affiliates are able to use the discount as well! @Anonymous The discount codes will be offered as a special promotion. Please contact affiliate@sigmabeauty.com with any additional questions. I have uploaded the image to my blog, however, when I open my site, the image is not there. Couldo you help me?! , please? Eu quero banner em portugues! @Dessa Jolie Please contact affiliate@sigmabeauty.com for the banners available in Portuguese! @blackasbeauty Yes! On top of earning 10% commission, affiliates can qualify for complimentary products through our Incentive Program and receive gift certificates through our Rewards Program! I have ordered brushes off the website and have yet to receive my package. I checked the track package page and it said delivered but still don't have it. @Paris Please email contact@sigmabeauty.com and provide the order number for additional help with your package. os afiliados ganham descontam nas compra na sigma??? se sim , onde devo comprar pra ganhar desconto? Affiliates do not have a special code or receive an additional discounts. However, you'll receive 10% commissions of purchases made by first time customers who use your link! @Lau'ndMakeup At this time, we do not have a discount code for the month of February. Do we still get 10% commission from returning customers? So if someone order through my link regularly, do I get commission from each order that customer makes or just the first one? You only receive 10% commission on purchases made by first time customers who use your link to purchase. You do not receive commission from returning customers. Please contact affiliate@sigmabeauty.com with any additional questions! How can I get the Official representative banner so I can post on my website? I would like to have one.Thank you. Hi! Please contact affiliate@sigmabeauty.com to receive an official representative badge!